Honest Amish Classic Beard Oil is for those men who are meticulous in their care for their beard. With the company who’s slogan was “better than an oil” for their various other beard products, they have now created a beard oil with the intent to be the better than any other oil. With fantastic reviews, and an average rating of 4.3 stars, on Amazon.com it seems that most men agree that this is a superior beard oil. The Honest Amish Classic Beard Oil is a great product at a great price that helps give men great looking beards. Initially, I was impressed with Honest Amish Beard Oil. This article will provide you with the pros and cons of this classic beard oil. Honest Amish has built a very satisfied and loyal customer base and maybe after this review you will be lead to try it for yourself. At Honest Amish, they don’t settle for an imitation of other beard oils, this is shown through their commitment to an environmentally friendly product and by using all natural ingredients. In the Honest Amish Classic Beard Oil they use avocado, virgin pumpkin seed, sweet almond, golden jojoba, virgin argan, and kukui oils. All these combine to provide the nutrients and vitamins needed for the beard to stay healthy and soft. Here are some of the specific ingredients. The golden jojoba oil specifically contains a high content of beneficial minerals and specifically vitamin E. Jojoba is used commonly in hair products to moisturize and hydrate. One unique characteristics of the jojoba oil is that is is a light oil which leaves your hair moisturized instead of greasy and heavy. Kukui oil is known for its soothing properties, strengthening hair, and can also help prevent dandruff. Kukui oil is also well known for improving the appearance and especially the luster of the beard. Not only does the Kukui oil soften and strengthen the beard but it also promotes hair growth. Kukui is high in Omega-3 fatty acids which are essential for promoting beard growth. With other natural oils in Honest Amish Classic Beard Oil there are many different benefits besides simply softening facial hair. All these together will help to prevent dandruff, soften skin, promote hair growth, and at the same time strengthen the skin and the hair. First off, beards are an entirely different type of hair than what’s found on the head. Beards are usually very coarse and sometimes brittle, the purpose of beard oils is to soften the facial hair. A good beard oil will help to make the wiry hairs soft and is also intended to keep the beard from becoming itchy. Using natural beard oils helps because, first, it’s natural. Second, it will maintain the beard for longer than those using chemicals and other artificial ingredients that over time will dry the beard out. For those who are considering beard oil for the first time remember this, a good looking beard is well maintained beard. Looking at Honest Amish, if you see their logo once, you’ll never forget it. Instantly recognizable the packaging is great and bottle containing the oil is helpful. Every bottle of Honest Amish beard oils contains a dropper for application. This small detail is very convenient and makes spreading the oil through the beard helpful. Just a few drops (depending on the length of your beard) and you’re ready to run it through the rest of the hair. 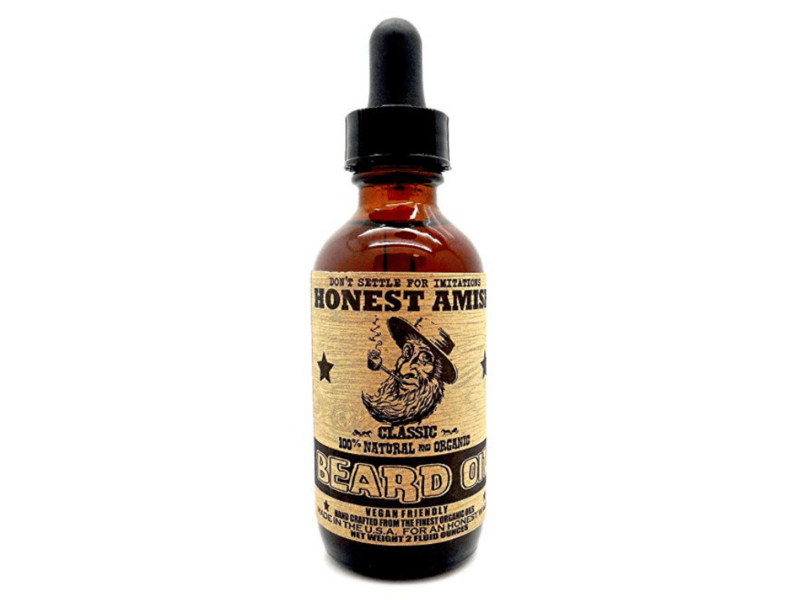 As it was said previously, Honest Amish’ product has become very popular among the various different beard oils. The reviews on Amazon are great, many different men speak of switching from other beard oils to Honest Amish Classic Beard Oil after one or two uses. One thing that can make or break it for sticking with a beard oil is the smell. According to the Honest Amish website their beard oils have a peppery or woodsy scent. Many of the men who have reviewed this product on Amazon have said it has a strong smell and many have compared it to a black licorice scent. It will depend on how discerning the customer’s nose is as to whether or not the scent is for them. Many customers have also noted how this particular oil is long lasting and will make it through the day with them and whatever activities they may be involved in. All it takes is a few drops to moisturize the whole beard. Run the oil through the beard and feel the difference as the hairs instantly get softer. The oil doesn’t run as the day goes on and it doesn’t become unbearably greasy either. Honest Amish has built a very satisfied and loyal base of customers from the beard oils they have begun to produce because they strive for quality and customer satisfaction. They have developed a high quality beard oil that comes at a great price. People rave about Honest Amish and will continue to do so. This is a company that is looking to help the customer out and provides a large assortment of product for the beard to keep it healthy and looking good. The pros for this beard oil is that it has a very good list of natural oils used as ingredients, it is a very reasonable price, and it comes from an environmentally conscious company. Customers have left reviews stating that they don't like the smell or sent of the oil. Some thought the scent was too strong and did not want to purchase for that reason only. Overall, Honest Amish Classic Beard oil is a quality product with quality results. The majority of customers agreed that this classic beard oil will leave your beard softer, with more luster, and will strengthen both your hair and skin. It made it difficult to find faults in this product with so many positive Amazon review. If there was one con to this product it would be its sometimes overpowering scent. In conclusion, Honest Amish Classic Beard Oil has a lot of pros with only a few cons. The pros for this beard oil is that it has a very good list of natural oils used as ingredients, it is a very reasonable price, and it comes from an environmentally conscious company. The con that has been pointed out by some customers is that the scent can be overpowering. All in all this is a product that has become a favorite to bearded men all over. There are many different brands of natural beard oils, but you will be hard pressed to find ones that have as good a mix of oils as Honest Amish. The goal for the company with their beard oils is to make a product that is “the best for your beard.” They are well on their way to that goal and have made a great beard oil for all. Here are some top questions that I found for people seriously considering buying the Honest Amish - Classic Beard Oil. How would you describe the scent? It is very woodsy and some even compare it to black licorice.